Well, we can cross that off the "to do" list. I thought it was a lot of fun. Of course we way outgear the place so some bosses didn't get into phase 2, but we downed everyone in, roughly, 90 minutes. The Gul'dan fight has always been visually amazing. 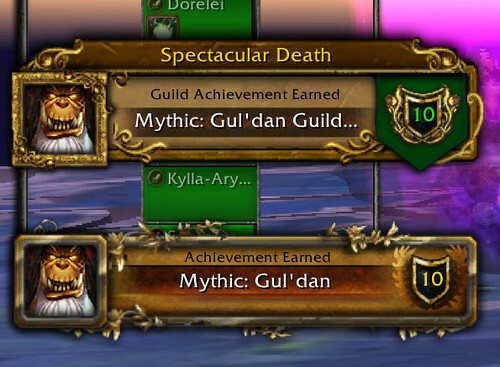 In mythic, it's doubly so. Note the eyeball in the background. That motif has continued into Uldir with an eye of C'thun behind Zek'voz. Trust me on this. Somewhere, in the thousands of screenshots I've taken, is an image of C'thun's eye on the wall behind Zek'voz. I thought I posted it to FB because some of you didn't believe me, but it's true. I'll find the screenshot when I'm looking for something else. What's left of old content? 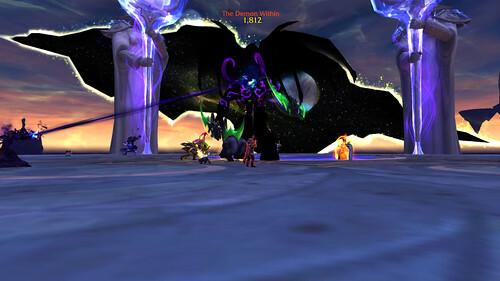 Well, we have that very annoying place, Tomb of Sargeras, unconquered in mythic. That end boss, Kil-something or other, just kills us without a second thought so we set it aside last year and haven't decided when we're going back in. 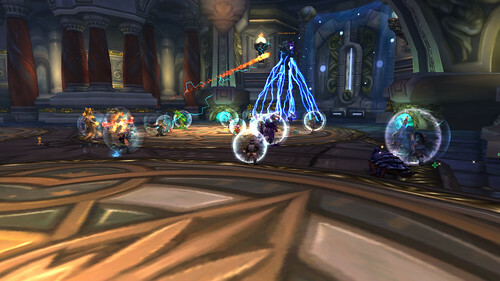 Here's the thing about Kil'jaden and mythic Tomb. 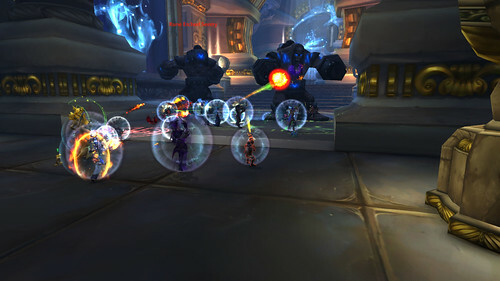 We're struggling against Zul in Uldir. 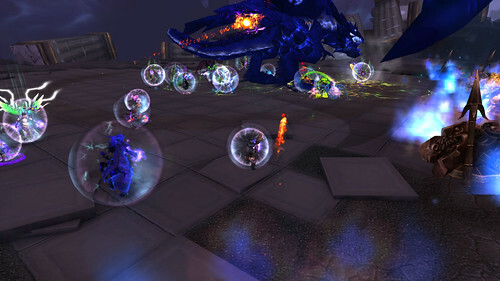 If we can get Zul down without a huge struggle or a massive amount of random luck, we have a chance to blast Kil'jaden through the phases that wipe us off his platform. He would never get a chance to do those phases for very long. But, we'd need massive amounts of dps. So, by working to raise your dps for Zul, you've given us a shot at clearing mythic Tomb. If we struggle against Zul, we're going to struggle against KJ and it's not worth the repair bills to go in there and wipe continually. Now, speaking of clearing things, Deathtacular did this. Raids left to clear are Baradin Hold in Tol'Barad and Heroic Garrosh in Siege of Orgrimmar and then we'll be solidly in Warlords content where there are a number of things we haven't done as a guild. To clear Baradin Hold, we need to take Tol'Barad from the Alliance. That's one battleground where Alliance seems to have a bit of an upper hand. 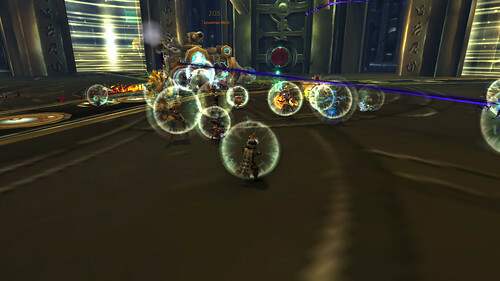 It's a level 85 raid so if we can nab the battleground, we can take a lot of people into BT. 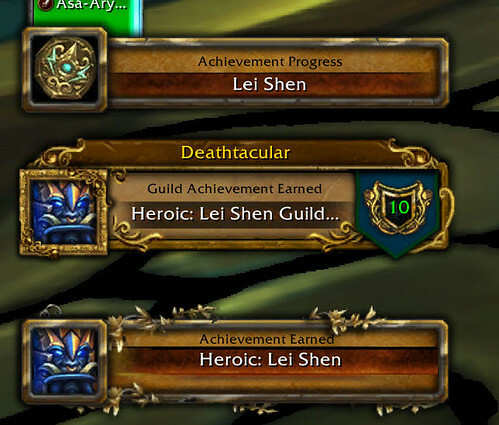 Heroic Garrosh is level 90 but we need at least 18 people to make a guild group to get the achievement. So, we'll need all hands on deck when we go do that. 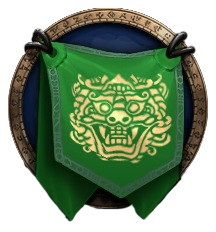 When we head into Warlords and beyond content, we'll need at least 16 people because the achievements require that 20% of the allowable raid numbers be guild members. 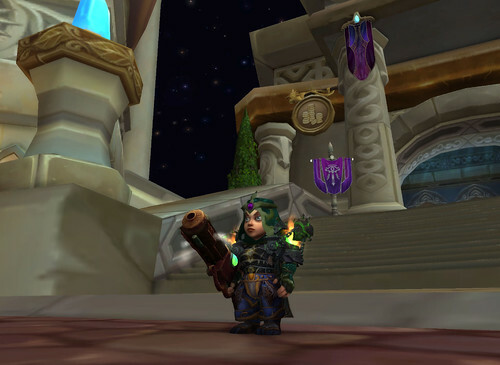 So, if you're looking for something to do, level those horde toons to 100 so we can wander through Warlords and beyond content and get achievements. Thanks to everyone who participated in both of these events. I love getting achievements and I hope you do, too.